The Gefen Mini USB-2 Extender allows the extension of any USB 1.1 device up to 150 feet (45 meters). The Receiver comes with a 2-port USB HUB. This extender exceeds the 16-feet distance limitation of USB extension by using Extreme USB technology to extend USB up to 150 feet (45 meters) away from the computer. This solution is ideal for applications where two USB devices, such as a keyboard and mouse, must be operated remotely but is also useful with most other USB-based devices. Connect the Sender unit to the USB source using the included USB cable. Place the Receiver unit up to 150 feet (45 meters) away from the USB source. 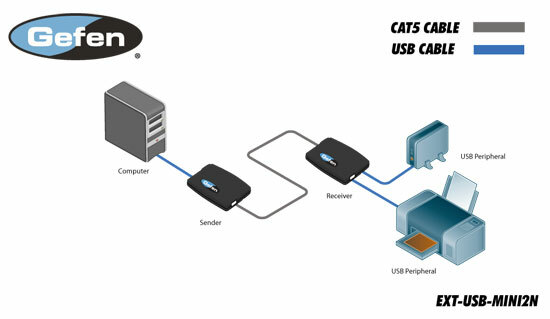 Use a single CAT-5e cable to connect the Sender unit to the Receiver unit. Connect up to two USB devices to the Receiver unit.